Freddy Krueger is back! After 15 years, Robert Englund is returning to the role he made famous in A Nightmare on Elm Street in the upcoming Halloween episode of The Goldbergs. Now, ABC has released a fresh batch of photos from the episode, showcasing Englund back in full Freddy garb and it is truly glorious. This is nothing shy of a beautiful gift for horror fans and could easily be the most exciting thing coming our way this Halloween season, even when taking into account that a new Halloween sequel is bringing Michael Myers back to the big screen for the first time since 2009. The images, rightfully so, focus heavily on Robert Englund's triumphant return as Freddy Krueger. Wendi McLendon-Covey is also heavily present as Beverly, who will be duking it out with the horror icon in her dreams, or nightmares rather, in the episode, which is appropriately titled Mister Knifey-Hands. The photos look like they could be ripped right from an 80s set sequel to A Nightmare on Elm Street we never saw. And not for nothing, but Robert Englund looks absolutely pitch-perfect and very much like the Freddy we all know and love. These new images go great with the previously revealed photo that recreated the iconic shot from the promo shoot for A Nightmare on Elm Street 3: Dream Warriors. In The Goldbergs upcoming Halloween episode, despite Beverly's wishes, Jackie's parents allow Adam to watch A Nightmare on Elm Street. A disagreement between the families takes place as a result. But Beverly dreams of facing off with horror icon Freddy Krueger, which teaches her an important lesson about her son's relationship with Jackie. At the same time, Erica realizes she's not as popular as she once was as she starts hanging out at William Penn Academy despite the fact she's no longer a student there. What more could horror fans possibly want? We get to see Freddy Krueger facing off against a female protagonist in an 80s dream sequence. That's literally the best case scenario. 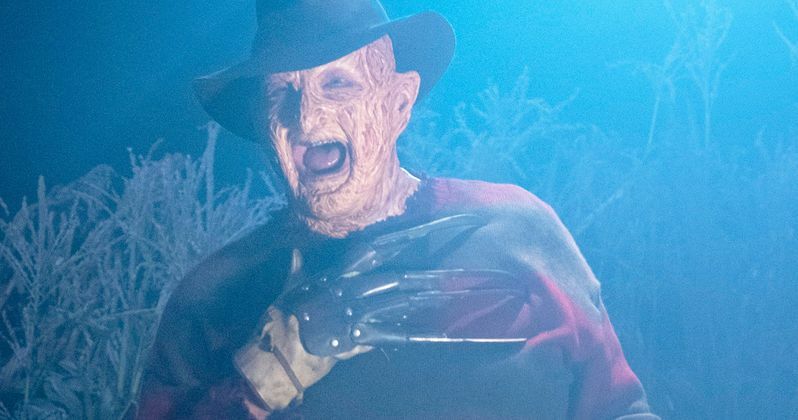 We haven't seen Freddy on the big screen since the 2010 remake, which starred Jackie Earle Haley as the iconic slasher and, to say the least, it wasn't received very well. Robert Englund retired the role after 2003s Freddy vs. Jason, which delivered the horror icon showdown people had waited years to see. With that in mind, it's high time we got some Freddy in the world and ABC is giving it to us. Robert Englund is 71-years-old. Not only is this probably going to be a lot of fun, but this is very likely going to be the last time he plays the part. That makes it downright special. Even for those who don't regularly watch the show, that should make it well worth the time. The Goldbergs Halloween special is set to air on ABC on Wednesday, October 24. Be sure to check out all of the new images for yourself below.